Fully assembled model of the second and final prototype version of my Princess Celestia papercraft design. Printed at this scale (four A4 sheets) it stands approximately 20cm (8") high, excluding the horn and crown. It is based closely on the model for my earlier Nightmare Moon papercraft design, with the addition of a new mane style, a separate breastplate piece (instead of just a texture map as on Nightmare Moon), and slightly modified back legs. No major changes were made between this prototype and the final design other than some adjustments to the textures. This is my favourite among the three ponies you posted. Can someone PLEASE make a pdf of this? whenever i save it to my computer it prints out faded and then when i print it from my browser, it only prints like, 1 fourth of it!!! PLEASE HELP ME!!! 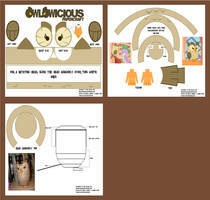 i got a question: i am making a site for papercraft, is it ok if i pot this and some other models of you on my site. if i give you credit and if i give a link to your deviantartpage. please! you. are an awesome person. Oh wow, awesome! I could never master paper craft models D: haha. YES! I can't wait to get started on Celestia and Nightmare. if you print them half page (page 1 & 2 on one page) it comes out to coinside with Kna's paper ponies almost perfectly! Thanks a ton for this papercraft! Awesome..! I hope to do it..! Excellent model! I'm working on it right now to! I only have one critique for your design however. Most paper craft designs do their best to avoid disrupting large portions of identifiable sections with cutting edges. The eyes for both this model and the NNM model suffer from this flaw. If there is a way to redo the head so that the eyes are mostly folded into position rather than glued together, then the model would look much nicer even if it disrupts the front to back assembly order a bit. With parts like the eyes being segmented I get a fine point sharpie with the colour I need and just touch up little sections that look detached and It really helps clean up areas I did an oops on or parts your referring to. Also for anyone considering making one, this is papercraft #5 for me and it still took 2 full afternoons to cut out and assemble. Worth it, though. Thanks - you did a good job making yours. Some fair points raised in your critique there, too - I spent quite some time experimenting with the tab positioning on Nightmare Moon (on which the Celestia model is closely based) and went with what made for easier assembly. I guess an alternating tab order would make the seams less noticeable, but that could also make assembly harder. Something to tinker with, I suppose. The face too was a compromise; I tried to strike a balance between detail and component size, and erred on the side of keeping the polygon count down, which makes the components less fiddly to assemble but also makes them boxier-looking. I may revisit the design and see if it can be improved without making it too fussy. I could see reversing the tabs would make it harder. The head overall could definitely get away with being more detailed though. The whole upper back leg region was quite a bit harder (and it shows) than the head, and the head is what draws the eye the most. It probably takes alot of time to change the models though, so its not a big deal. I'm probably just nitpicking anyway. Please tell me you're gonna make an alternate version with her Molestia face. I wanna make her, and sit her beside my keyboard to watch me clop clop clop. Why must you encourage me to do terrible things? Because, that is what I do best. Thank you for giving in to my influence. is the collar bit supposed to glue to the neck or....? At the back behind the neck and with the two tabs at the front, yes. A photo assembly guide is going up very shortly. The assembly guide is up now. To clarify, the collar/breastplate piece is a separate part that is laid on top of the neck/chest area. A little dab of glue on the back of the neck, plus the two tabs near the front, should be sufficient to keep it in place. Looks gorgeous! Can't wait to make it! YES! now i can have my NMM fight someone!!! Princess Lune: "I'm coming little sis!" you didn't actually make that out of PAPER? Thats so cool!! !